A rally/racing game in which much relies on having your car not topple over. The cars run on a bumpy course, and all four wheels' torque and suspension is calculated individually, in turn affecting the car's momentum and rotation. 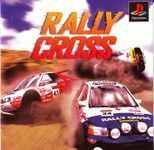 The cars are more like off-road trucks than rally cars, and keeping the balance on the bumpy road becomes the main part of the game; Rally Cross is less a racing/rally game with high-speed drifting, and more a three-dimensional physics engine with cars in it. The US version has a 4-player mode, whereas the Japanese version only allowed for 2 players, while also allowing an "in-car" view that the US version didn't have. It was sequelled by "Rally Cross 2" that ran on a completely different physics engine and thus shared nothing with the original game except the title.